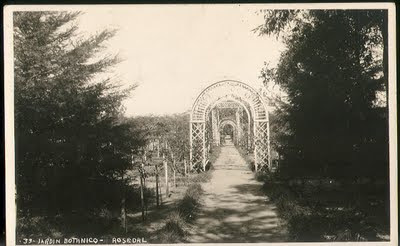 Found while flea-marketing with my sister...this c. 1920s image of the rose garden at the Botanical garden of Asuncion. On the back it reads, "This is the real beauty spot of Paraguay. Our schoolchildren often go here for pictures. The garden is in the care of a German scientist." According to a biography at the website of the Ibero-American Institute, Dr. C. Fiebrig (1869-1951) was offered two botanical jobs in 1910, "a proposal to work in the German Colonial Office for Eastern Africa and the offer of a chair in Paraguay at the National College and School of Medicine. Fiebrig, who already lived since 1907 in San Bernardino, Paraguay, decided to accept the post offered him the Paraguayan government [because] this offer also included the proposal of then President, Dr. Manuel Franco, to create a botanical garden." Created from over 600 ha of the former estate of dictator Francisco Solano Lopez on the outskirts of Asuncion , the garden opened in 1914 and Fiebrig remained its director until xenophobic fears forced him out of the country in 1936. "The Botanical Garden not only had a port near the Paraná River, but also had its own train station with a network of 60 km of well maintained roads and a large swimming pool. Gradually Fiebrig also created a zoo, a herbarium, a Botanical Museum, and finally, the Cotton Institute. The latter contributed essentially to finance the entire complex." 45 plant species and 18 animal species bear the eponym 'fiebrigii' in honor of the botanist, but his masterwork, a 2700-page manuscript on the botanical ecology of the South American continent, languishes unpublished in his native Germany, at Berlin's Ibero-American Institute. You can still see his garden, though. 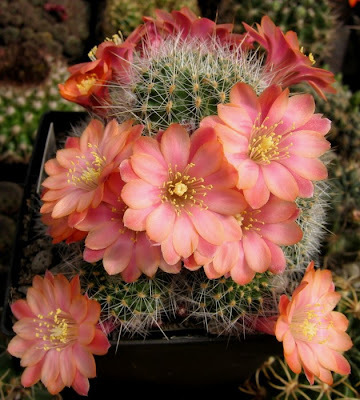 It always surprises me how lovely cactus flowers are. What a good find, and interesting history. yes, from the very prickly, unwelcoming plant comes the most astonishingly beautiful flower...very metaphorical. Your site was recommened to me by Thethymelygardener and I'm enjoying reading it. Am very interested in your subject, Garden History, also garden philosophy. Maybe some scholar will eventually update and publish Dr. Fiebrig's unpublished manuscript. Even flea-marketing has gardening moments!